When teeth have been lost, it can lead to damaging outcomes for a patient’s oral function, full body health, and specifically their quality of life. 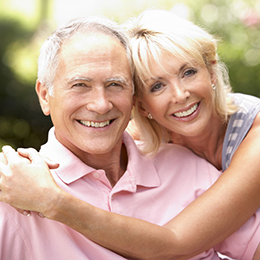 Dental implants are the best solution to having new teeth which are almost identical to one’s natural smile. Dr. Collins will take you through every step of the dental implant process, ensuring an easy renewal and rebuilding of your perfect smile. You can trust Dr. Collins and his staff to give you all the support and encouragement as you go through this process. You will always have a temporary solution throughout the dental implant restoration process and will never experience a day without functioning teeth. Once the implants are fully functioning you will be ecstatic with your amazing results! 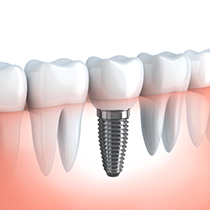 Dental Implants are the ideal reconstructive solution to tooth replacement. The entire tooth structure including the root is restored which can improve the patient’s overall oral function, health and quality of life. Dr. Collins will provide you with a thorough implant consultation. He is a member of the International Congress of Oral Implantologists, and attended continuing education courses to obtain this accreditation. While teeth can be replaced with crowns (the white visible portion above the gum line), oftentimes the root is not stable. The tooth root is embedded in the patient’s jaw. When the root deteriorates, the jaw can either rescind or become painful. Also, the teeth may become misaligned, which can cause other visible problems and an uncomfortable situation. Dental implants are effective because they replicate the entire tooth and become a permanent part of the patient’s jaw bone. Patients experience health benefits, huge aesthetic improvements, better oral functioning and long term durability. First Dr. Collins will give you a thorough implant consultation that is tailor made to your own unique situation. The beginning step of the process is to surgically place one or more implants into the jawbone. We will use our 3D cone beam scanner, which helps Dr. Collins precisely set your new implants into the bone and accurately align the tooth structure. In a few weeks, once your natural bone grows around the implants and the implants are securely embedded in your jawbone, Dr. Collins will meticulously match your existing teeth to restore the teeth structure above the gum line and present you with a fabulous personalized smile restoration. Whatever the procedure you decide on, Dr. Collins and his staff will work with you to determine which option best compliments your personal goals and budget.